The enormous number of passwords & logins in our lives have made it necessary for many of us to use a password manager to stay organized. But until now, password managers were either standalone desktop applications, or subscription-based services which would sync & store your secrets through a third-party server. Neither of those options are ideal. Your digital life probably spans multiple devices, so a local password “vault” would leave you locked out of essential services on-the-go. At the same time, you might not be comfortable with handing over your most sensitive information, even in an encrypted format, to an outside company. 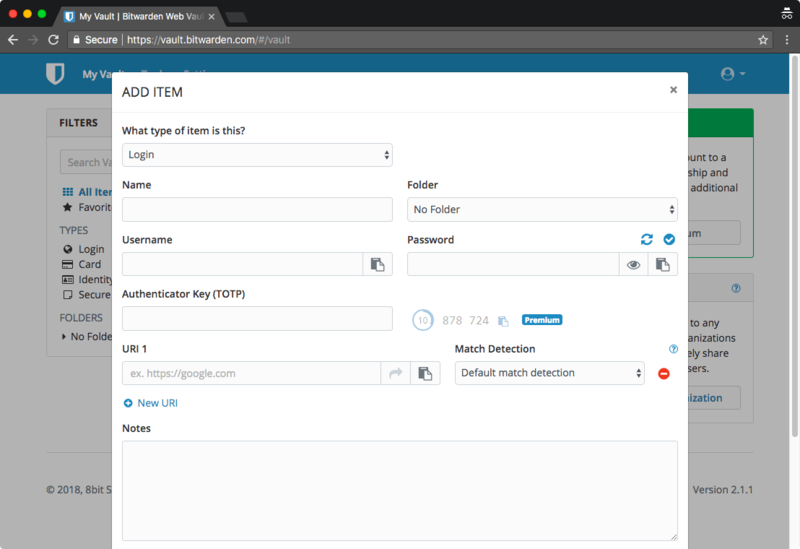 BitWarden is an open source, password manager you can host in your own environment, whether its on-premise or in the cloud. Compared to solutions like LastPass or 1Password, you can control where your BitWarden server is hosted and how it is secured. In line with industry practice, any secrets you store in BitWarden are encrypted client-side with your master password before ever being transmitted to your sync server. Because BitWarden is open source unlike its competitors, any developer with the requisite knowledge can check there are no backdoors in the application. BitWarden has auto-fill functionality for every major browser, including Chrome, Safari, Firefox, Microsoft Edge, Opera, Brave, Tor Browser, and Vivaldi. You can also access your passwords using BitWarden’s desktop application for Windows, Mac, Linux, in addition to mobile apps for iOS and Android. If you have scripts or applications that require programmatic access to the credentials inside your BitWarden vault, there is even a provided CLI. And of course, you can login to the web-based interface to view your passwords at any time. BitWarden’s licensing is simple. It is free for up to 2 users, $1/month for up to 5 users (“Family” plan), and $3/user/month for enterprises. You may sync unlimited devices, even on the free tier. If you wish to have features such as hardware token authentication, TOTP code generator, and file storage, the Premium features cost $10/year for your entire server. The recommended way to deploy BitWarden is as a Docker stack on a Linux or Windows server. With such a sensitive application, it is particularly important to do the deployment securely, which includes hardening the server, properly configuring HTTPS, and setting up regular backups for the MS SQL database that BW relies on. Contact our infrastructure architects and we will show you how managing your passwords, secure notes, credit cards, and identities can be more user-friendly with this fantastic open source alternative.